Yesterday I met with my relatives from the USA and took them on a tour of Belfast. 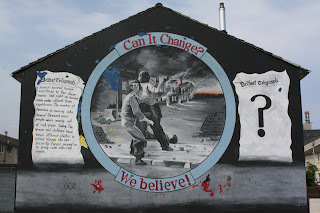 We started with a Black taxi political tour, taking in the loyalist and republican areas, viewing the murals, the peace lines and the memorials. It was really interesting. We then toured the continental market at City Hall, then The Crown Bar (reputed to be the most bombed bar in Western Europe) for a Guinness before going to Deanes for Dinner. The meal superb, the company excellent and the day complete.